JOHN COLTRANE BLUE TRAIN COMBO - This Long Out of Print CLASSIC RECORDS 45 RPM 12 Four SINGLE SIDED LP Set was mastered from the Original Session Tapes to 200 Gram QUIEX - SV-P Heavy Virgin Vinyl and is one of the Rarest Limited Edition Audiophile LPs in existence. THIS ORIGINAL 1ST EDITION 200 GRAM RELEASE HAD THE COMPLETE TIGHT WRAPPED PLASTIC SEAL TO VERIFY THE ORIGINAL PRESSING AT 45 SPEED AND WAS TREMENOUSLY LIMITED. THE SECOND EDITION HAD A LOOSE WRAP. PLUS FOR THE COLLECTOR WHO WANTS IT ALL THE Classic 24/96 DAD DVD AUDIO ONLY CD. Out of Print ALSO 1st Edition One of the last left in the world still factory sealed. & TYPE IN COLTRANE INTO THE SEARCH FIELD WITHIN OUR STORES SECTION AS YOUR PERSONAL CODE AND ALL INDIVIDUAL TITLES + INFORMATION WILL APPEAR. Revolutionary Digital Audio Product that plays on a home DVD Video Player. The tenor sax giant had signed with another label when he embarked on this one-off date for Blue Note, an excursion that paid off with an enduring modern jazz masterpiece. Boasting volley after volley of smart soloing and intuitively swinging rhythm work, BLUE TRAIN is a joy, from the coolly precise ensemble entry on the opening title piece through the sets balance of elegant hard bop conversations and smooth downshifts into ballads. John Coltrane wrote four originals, all of them now regarded as standards, and assembled a rhythm section including pianist Kenny Drew, Miles Davis rhythm section of bassist Paul Chambers and drummer Philly Joe Jones, and trumpeter Lee Morgan and trombonist Curtis Fuller. Coltranes signature sound, now fully developed but still hewing more to familiar blues and chromatic harmonies than his later modalities, is confident and expansive, and his partners respond vividly throughout. Tracks include: Blue Train Moments Notice Locomotion Im Old Fashioned Lazy Bird. The Classic 24/96 Digital Audio Disc DAD is designed to be an audiophile musical reference. The process starts with the encoding of an analog signal from a live microphone feed or more commonly from an analog master tape. The highly sophisticated Analog to Digital converter (A to D) samples the analog signal 96,000 times per second (96kHz) and assigns a numerical value to each sample point.. The 96kHz sampling rate is more than twice the 44,100 (44kHz) sampling rate used on standard CDs. The numerical value assigned at 96kHz about every 10.4 microseconds is stored as a 24 bit digital word. The significance of a 24 bit digital word is that there are 16.8 million different potential values for each 24 bit word. By contrast there are only 65,536 different potential values for a 16 bit word on a normal CD. The additional 8 bits on a DAD allows for over 16 million additional voltage values to represent the original analog signal. Further, 24 bit resolution offers 144dB of dynamic range from the softest to the loudest musical note. At 144 dB of dynamic range we greatly exceed even the dynamic range available on the worlds finest analog tape machines. For the first time in history of digital audio, we can provide Master Tape Sound MTS. After the analog signal is encoded, the resulting 24 bit/96kHz digital data stream is stored on a large computer hard disk. The raw data is then transferred to a post production facility for authoring a process that results in the creation of a digital tape called a DLT that is sent to the disc manufacturing plant. At the plant, the DLT is used to make a glass master which produces stampers that are used to injection mold DAD discs. In all, the process is quite a bit more involved than making CDs but is worth the extra effort when you hear what this technological wonder has to offer. Four SINGLE SIDED 45 Speed 200 Gram LPs. This Long Out of Print 45 LP SET was mastered from the Original Session Tapes to 200 Gram Heavy Virgin Vinyl and is one of the Rarest Limited Edition Audiophile LP's in existence (only 500 ever pressed & one of the only copies left in the world). Each set has 4 LPs at 45 Speed, 180 Gram Vinyl on a 12 LP. Cannot be found at any retailer. COLLECTORS INFO ABOUT Classic Records TITLES. Classic Records has proven to be an Audiophile Company second to none in the new millennium. But ALL CLASSIC RECORDS TITLES ARE NOW OUT OF PRINT SINCE THE COMPANY WENT OUT OF BUSINESS IN 2010. These Editions have become some of the rarest pressings in the Audiophile Collector's Market. Just try to find them at any Audiophile Retailer after the next few months. When you take that into consideration, what will this Audiophile Pressing will be worth in the years ahead? It could be one of the most collectible pressings ever especially since Classic records is no longer in business. How rare and valuable are each one of these titles now still Factory Sealed Priceless! Mymusicfix has a very limited amount of these now Rare Factory Sealed pressings. We're sure you may not have known about some of these titles existed. Have fun collecting these Masterpieces! These are tremendous titles and artists that Mymusicfix still has in these LIMITED Edition STICKERS but we have very few pieces left of each title and prices will continue to rise as inventory continues to dwindle. This 200 gram pressing is the only way to verify that a 1st edition Collectors find from Classic Records mastered on a high-definition Virgin Vinyl pressing for superior fidelity. The nicest thing you can do for your stylus and your ears. The ultimate record -- the way music was meant to be heard and of superior quality for any Audiophile. For hundreds of additional Rare, Out of Print, Factory-Sealed Audiophile Recordings, visit Mymusicfix E-Bay Store by hitting the STORE TAB on this titles Home Page. Mymusicfix has been told we have the best collection of Rare, Out of Print music collectibles on E-Bay. FACTORY SEALED OUT OF PRINT PRODUCT is IRREPLACEABLE and therefore NOT RETURNABLE. International Buyers are responsible for their countrys. 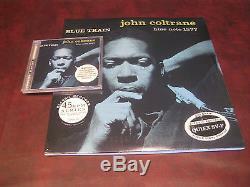 The item "JOHN COLTRANE BLUE TRAIN 200 GRAM 45 SP CLASSIC RECORDS + DVD AUDIO 24/96 DAD CD" is in sale since Monday, February 23, 2015. This item is in the category "Music\CDs". The seller is "mymusicfix2" and is located in Lake Forest, California. This item can be shipped worldwide.